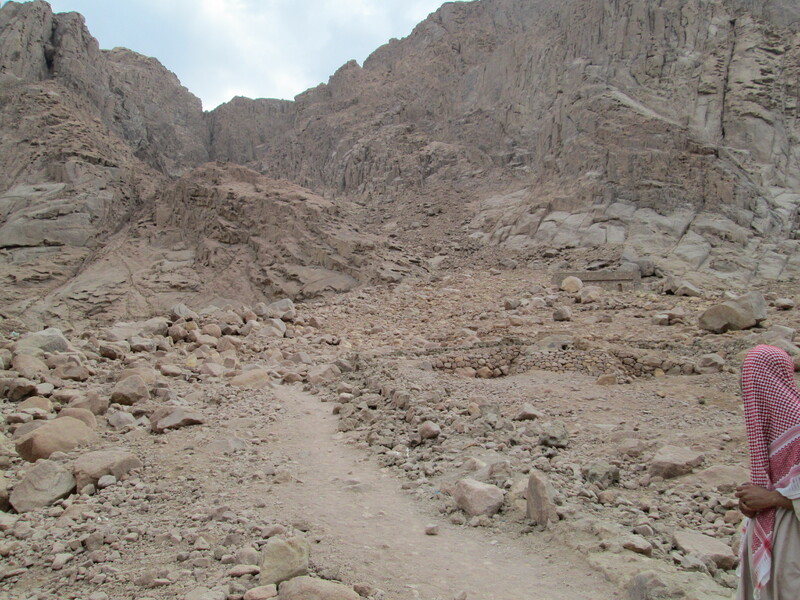 Yes… the same mountain Moses climbed to receive the ten commandments. I figured if I got to the top, maybe someone would see fit to dole out one or two commandments my way… you know… give me some direction and all. For those of you who are somehow unaware of the story of Moses and the Ten Commandments, here’s a link to it from the book Christians refer to as “The Bible”. 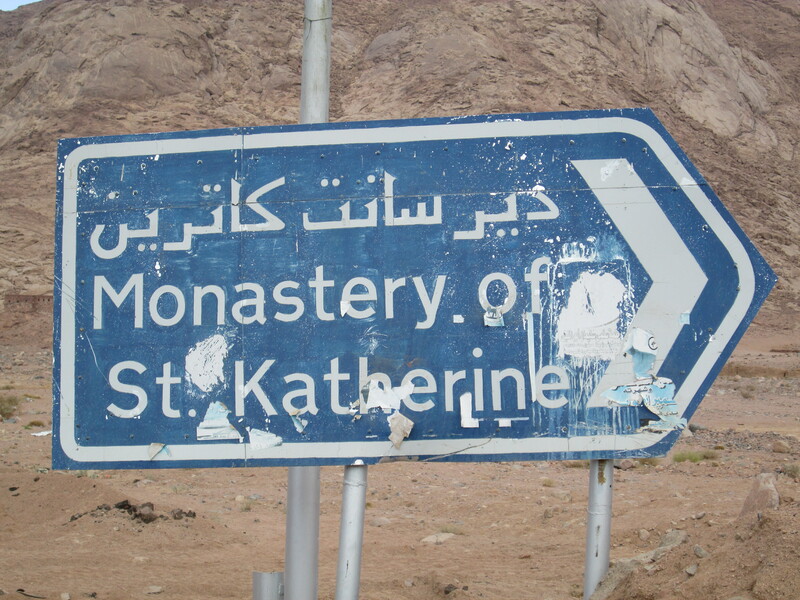 Now Egypt, Israel and Saudi Arabia all have competing claims to be the home the mountain where Moses received the ten commandments, but early christians established St. Catherine’s Monastery at the foot of Egypt’s Mt. 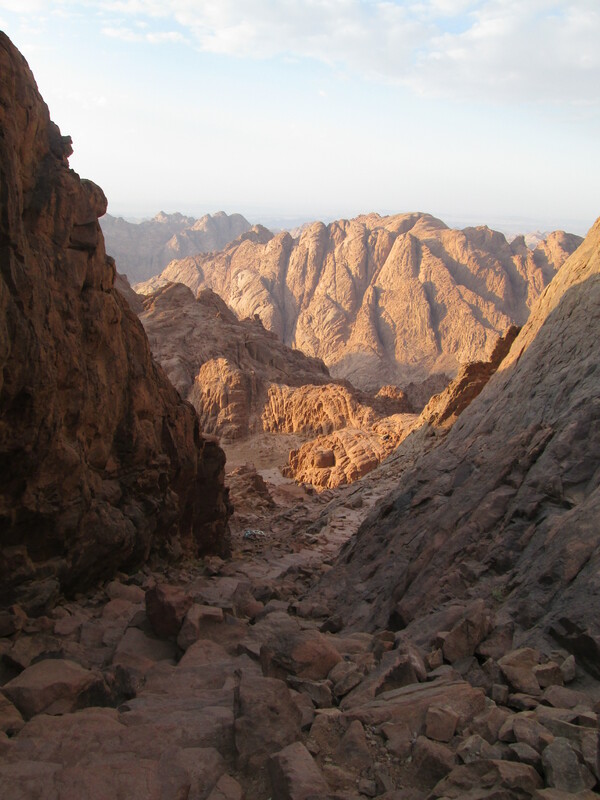 Sinai in the 4th century A.D. (St. Catherine’s is one of the oldest functioning monasteries in the world)… so I’m going in with them that this was the place. Since Mt. 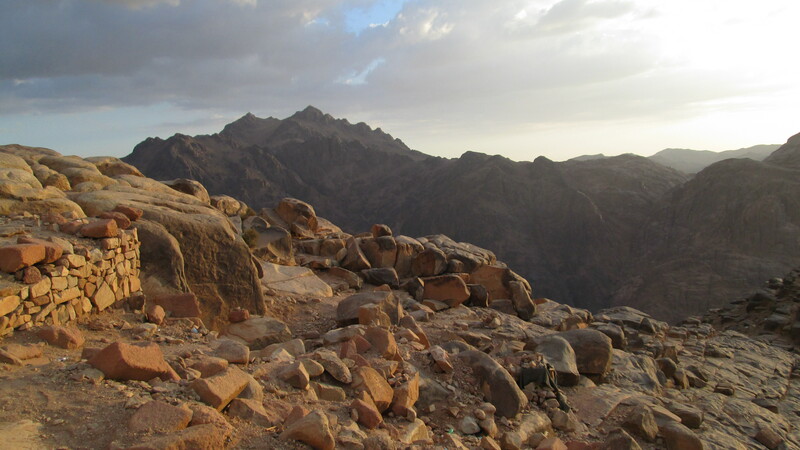 Sinai is located pretty much right smack dab in the middle of the Sinai Peninsula, visiting it from any of the Egyptian Red Sea Resort towns is relatively easy. 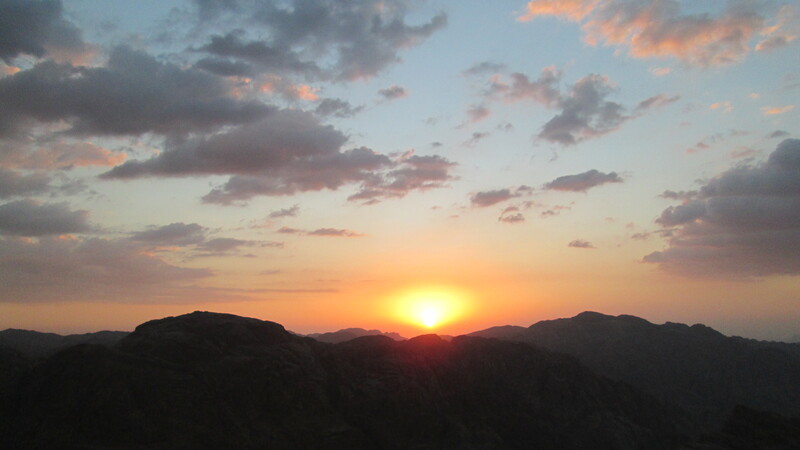 In fact trips to watch the sunrise on top of Mt. 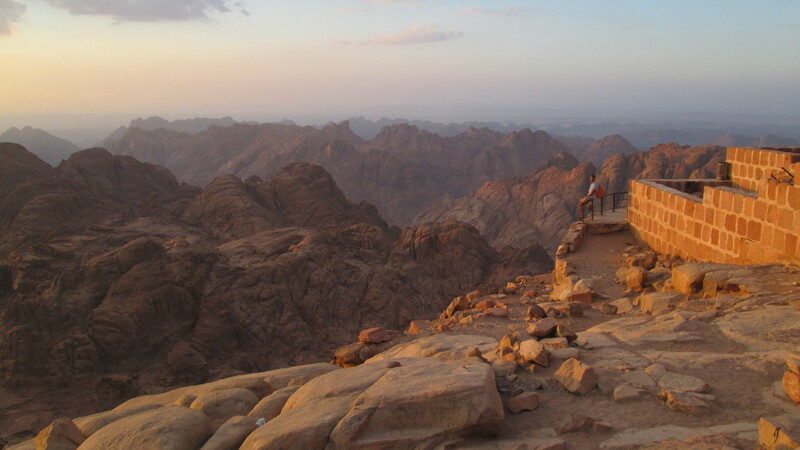 Sinai are pretty ubiquitous, and are offered by every single tour/excursions operator around. 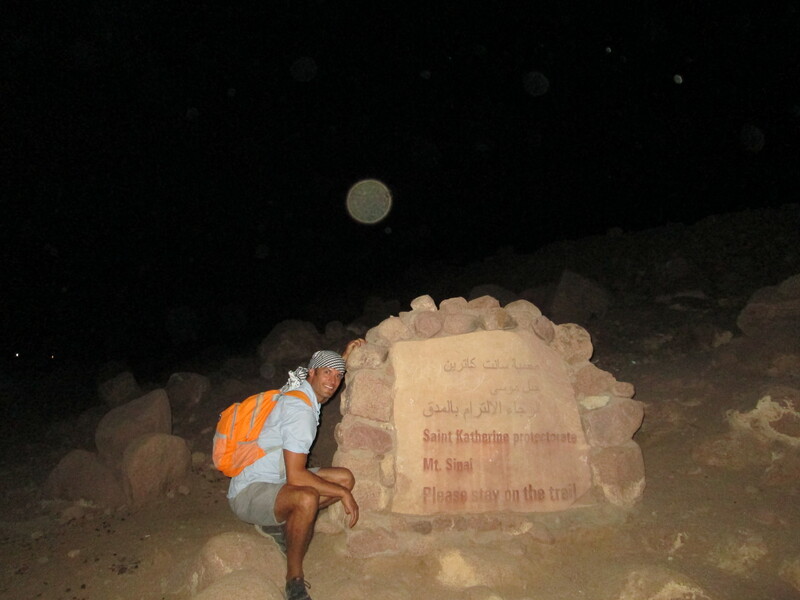 However, I felt those trips left a little to be desired… the standard itinerary being leave in a bus at 11 PM (yes, PM), arrive at St. Catherine’s Monastery in 2.5 hours, hike up the mountain with required bedouin guide (3 hours or so in the dark), watch the sunrise, hike back down, visit the monastery from 9 AM (when it opens) until getting back on the bus and returning from whence you came. No thank you. A day or two before, I’d gone by myself for a little snorkeling adventure in the blue hole… and it was all good until about noon, when the busloads of day trippers from Sharm El Sheikh arrived en masse… mostly italians. And don’t get me wrong… I love italians, but, frankly, large groups of italians are the exact last people you want around when trying to have a quiet moment to yourself watching the sunrise on top of a mountain. All the tour operators did advertise sunset trips, but when I asked around, those trips seemed to be somewhat seasonal, and there apparently just wasn’t enough demand for them at the moment, so no organized sunset trips. In a moment of weakness, I asked about the overnight trip to Mt. Sinai for the next night (which was a Thursday), but I was informed that there were no trips on Thursday because the monastery was closed on Friday mornings. And just like that, the invisible light bulb over my head switched on (okay… it’s really more like the dull flicker of a single lite brite piece)… if there are no trips at sunset and no trips tomorrow, if I go by myself, there’s a good chance I’ll have the mountain all, or mostly, to myself (plus I should choose to go at sunset because who really wants to get up that early). Planning done… onward to execution. And then we start climbing… note that I’m in decent shape for walking, but I’m sweating and breathing hard while Ahmed is bounding up and down the steps like a mountain goat… the steps seem to have no effect on him at all (granted, this is his job though… so I’m sure he’s done it more than once). To appear tough, every time he asks if I need a break I tell him no… but I’ll take one in five minutes… I don’t think it worked. Onward and upward. My guide Ahmed bounding ahead. Just in case you were wondering… yes, cell phones do work here. 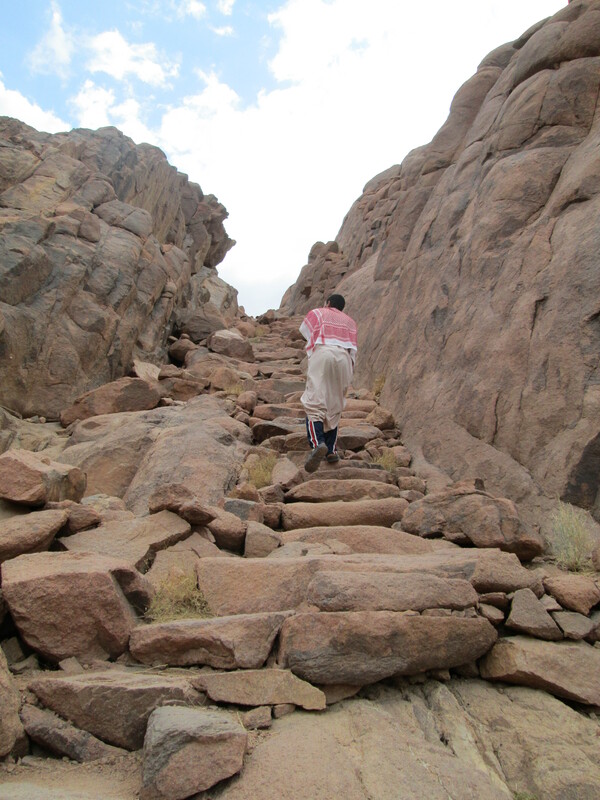 After a bit of time letting the experience marinate, Ahmed and I head back down. He doesn’t use a light (despite the fact that it’s getting pretty dark)… so I decide not to use one either (even though I have one). But the guy’s done this like a million times, so he knows where every little rock is and he diligently warns me when we’re coming up on steps or slippery spots. It’s pretty dark. 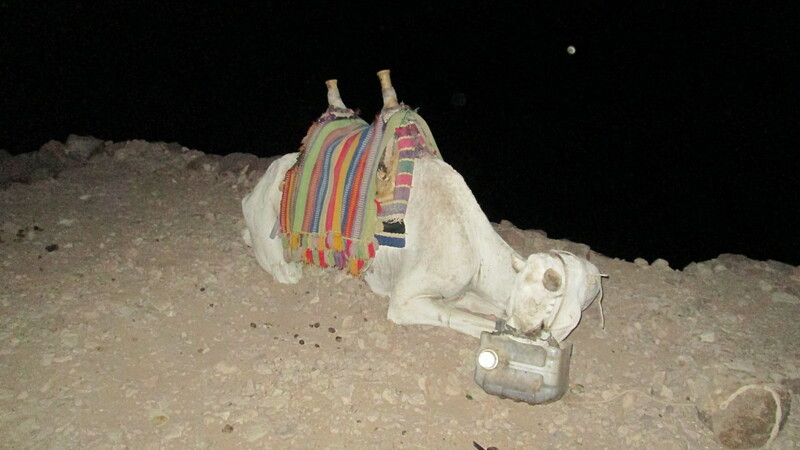 At times I can see a bit of movement just off the trail… I stop to investigate and realize that I’m seeing camels bedded down for the night (once I reached the bottom there were literally a hundred of them… plus you could usually smell them before you could see them). 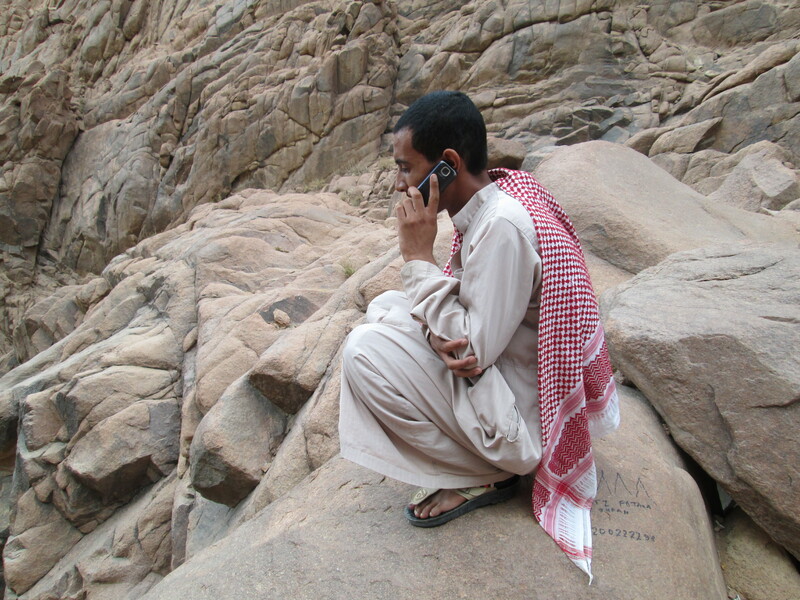 I do my best to keep up with Ahmed and somehow manage not to hurt myself. So for the stats… circa 4,250 steps to the top… took about an hour and twenty minutes with minimal (err… yeah… minimal) breaks. Spent about 45 minutes at the summit. And the way down took about an hour an 15 minutes. Plus I had to walk about 4 kilometers there and back from where I was staying. I left my hotel at around 3:30 PM and arrived back at 8:30ish. Total commandments received: 0. Other observations… there were trash cans all the way up (both the camel and the steps trail), but there was still garbage all over. 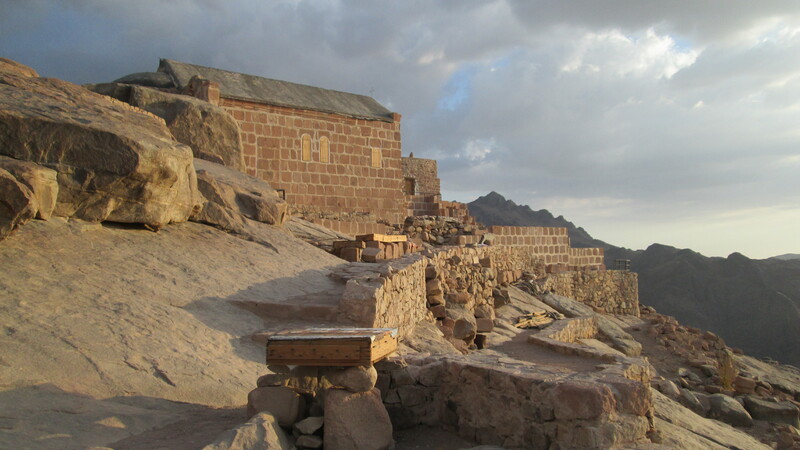 Several tiny churches dot the routes (along with several bedouin homes). There’s little valley set up with a camp just before the top of the 750 steps… so you can sleep there overnight and not wake up to early to get to the top and see the summit. 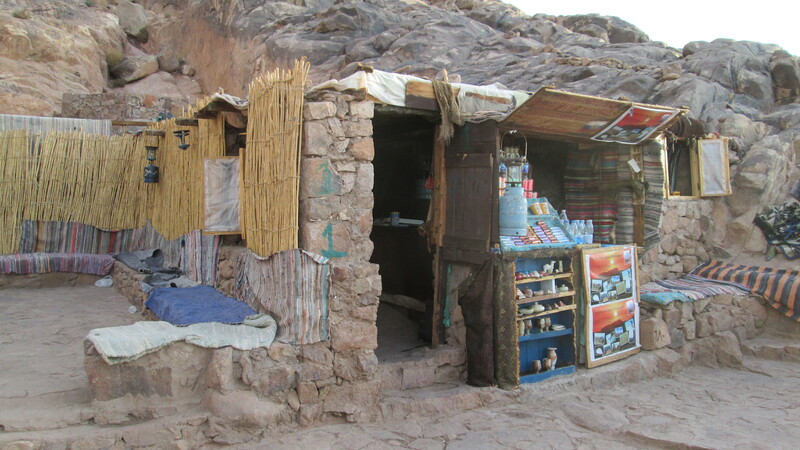 The last 750 steps contain a whole host of little shops for people selling food, drinks, souvenirs and renting blankets for cold nights (as well as some bathrooms). Although I brought a sweater, it only a little bit chilly at the summit and I didn’t need to use it (despite all the egyptians telling me it would be cold… it’s all relative I guess). So there it is… I climbed Mt. 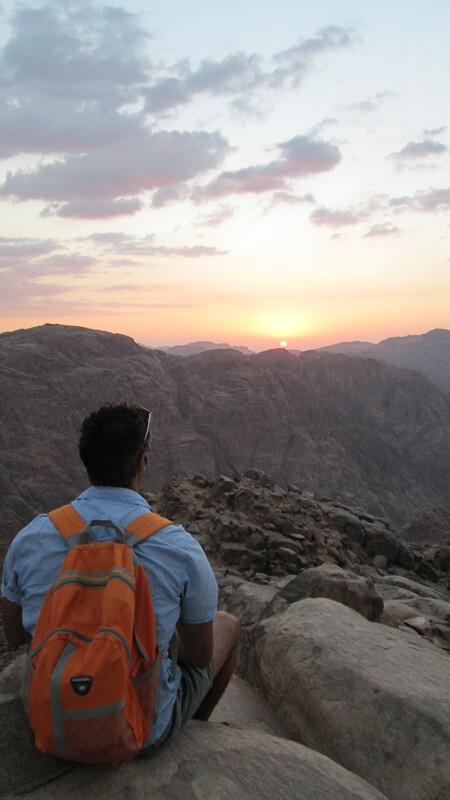 Sinai… mission accomplished. 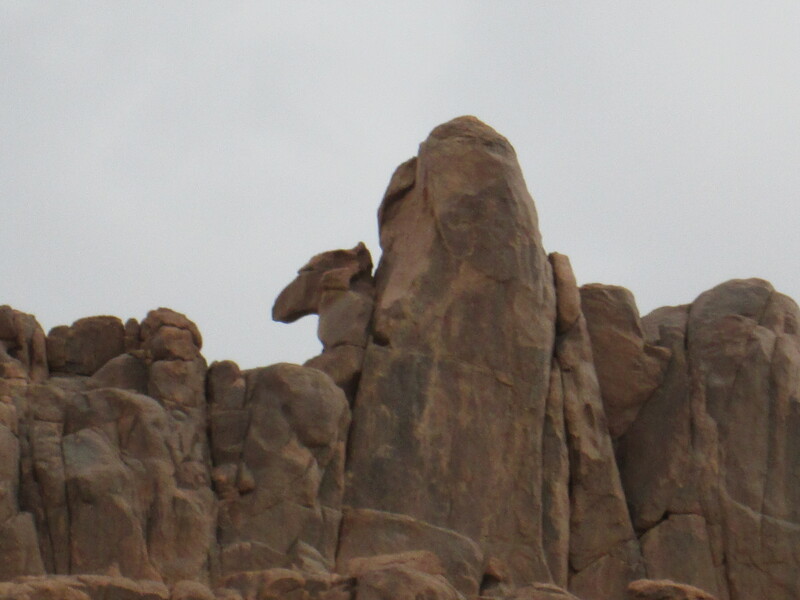 Can you guess the name of this rock formation? The church at the summit… there’s also a mosque just behind it. Oy! Ten! Ten commandments for all to obey! You’ve been waiting since I told you about climbing Mt. Sinai to use that line haven’t you?